By any conceivable criteria, this year’s Manchester City bunch should go down as one of the greatest Premier League teams of all time. In the face of the deepest, richest, savviest array of clubs from top to bottom in league history, as one member of a staggeringly competitive cadre of six superteams that have spared no expense in their attempts to secure one of the top four places in the table, City have annihilated all comers, turning what was supposed to be a tightly contested title race into a rout of historic proportions by midseason, crushing everyone with a ruthlessness and a panache many thought was not possible in the English league. It has been a wildly successful year. And yet it’s starting to feel like City might have lost their chance to permanently etch their names in the tomes of English soccer legend. Manchester City will win the Premier League. The surety of that statement hasn’t been earnestly contested for months now. They need just six points in as many matches to make it official, and they remain on pace to consecrate their dominance with record-breaking points and goals-scored tallies. Because of these statistical facts and the aesthetic appeal of the play that has earned them their historic bounty of goals and points, there should be nothing that tarnishes their campaign. But for as iconic as the league trophy is, teams still need more than simply to win it to leave a lasting mark. After all, someone wins the title every year; it takes something special to stand out from the rest. And it’s how City have blown a couple prime chances to burnish their legacy over the past week that has put their place in the pantheon of English soccer somewhat in doubt. This weekend’s Manchester Derby was set up absolutely perfectly for the Citizens. The outcome couldn’t have gone worse. A home win over their biggest rivals would’ve not only sealed the league title, but it also would’ve done so in unforgettable fashion. 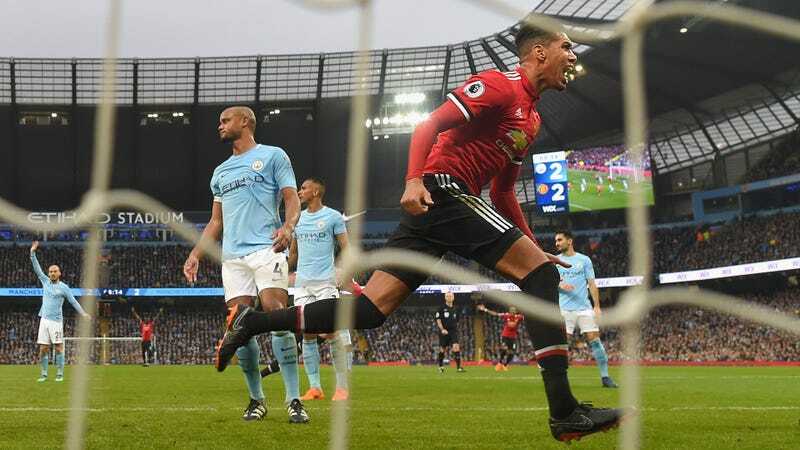 Instead, despite sprinting out to an early lead with a supremely dominant first half, City gagged up their advantage in the second and wound up losing, 2-3. Nothing about the match actually mattered from an objective sense. Though they lost, City were by far the better team and should’ve won easily. And while losing to the second place team means they’ll likely have to wait at least a couple more weeks to clinch the title, there is still no imaginable sequence of events that would see them fail to win the league. Still, losing that match cost City much more than three points. Beating United at home in early April to win the title would’ve been an iconic moment worthy of a place amongst the most heralded feats in English history. It likely would’ve been the shorthand descriptor for this season’s City team, the instantly memorable headlining event that in a phrase encapsulated City’s overall, season-long greatness. It could’ve been for City what the undefeated season was to Arsenal’s Invincibles or what the treble was to the 1999 Manchester United team. By throwing away the opportunity to cap this wondrous league season with a title-clinching Manchester Derby win—and doing so only days after getting smashed in the first leg of their Champions League quarterfinal tie against Liverpool—City’s season threatens to lose the critical luster it needed if it were to stand next to those generation-defining champion seasons of Premier League past. It would be a shame if this squad didn’t go down as one of the most exciting and fearsome teams to ever compete in the league, but if that happens, City will have no one to blame but themselves. All is not lost yet, however. City still should beat the league record for most points in a season, and could even hit the 100 points mark without too much trouble. Being known as the EPL’s first 100-point team would probably be enough to sear the 2017-18 Manchester City name into the annals of Premier League history. Plus, there’s still the outside chance that they could pull off a comeback against Liverpool in the Champions League. On top of what Pep Guardiola and his men can do this year, if the current season goes down as the start of a true Manchester City dynasty that winds up bringing home lots of titles of the domestic and international variety, then maybe the United and Liverpool losses will gain iconic status for how they spurred the team on to future greatness. What ever happens, though, City must realize that the inflection points of a given season that might not seem that significant in a broader sense are often what separate the legendary from the merely great. If they are to solidify the legendary status they’ve come so close to establishing, they’ll need to close the season with a bang loud enough that will reverberate throughout the sport’s long and cluttered history.